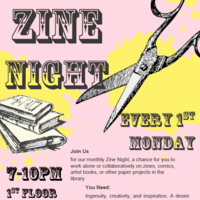 Join Us for our monthly Zine Night, a chance for you to work alone or collaboratively on zines, comics, artist books, or other paper projects in the library. Ingenuity, creativity, and inspiration. A desire to show off or learn new techniques. A want to work and get to know other zinesters and artists? The Aesthetics of Research is an ongoing initiative dedicated to exploring how resources shape and inform artistic practice across disciplines--from the tangible (print and electronic media, studios/workspaces, supply sources) to the intangible (workshops, tutorials, creative communities). With a slant toward non-traditional, indie, and underground art forms, the initiative seeks to connect artists to both resources and each other, forming a thriving network of like-minded creatives.